Looking for something special for Pujo, Poila Boisakh or a wedding? We found this boutique specialising in kantha sarees that you may want to look up. Looking for six yards of Bengal style? Nothing expresses it as well as a kantha saree does. 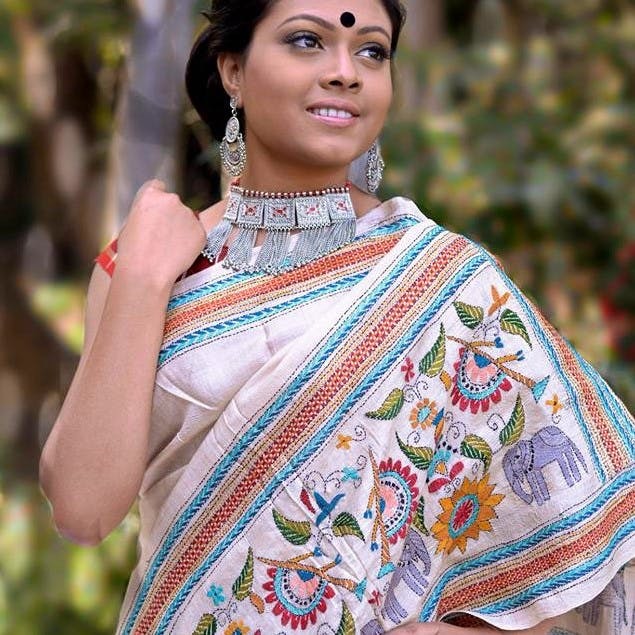 Sonajhuri Boutique (named after the famous Sonajhuri forest in Shantiniketan) has a selection of kantha sarees in lightweight silks. The colour palette is one of the most diverse we have seen in one store - lush creams on black. gorgeous deep maroons, midnight blues, flamboyant pinks and so many more. Each piece carries long lines of typical kantha work, a type of embroidery special to Bengal and that uses running stitches to create patterns. You will find a variety of patterns running across borders and pallus from multi-hued floral designs to village scenes, local motifs like haath pankhas or simple paisleys. Considering the amount of detailed work on each, the prices are very reasonable. You can check out their Facebook page first and then book a saree - message on their inbox or call or WhatsApp at 9051123624. They ship globally.